Specialty Rollers - Roll-A-Way Conveyors Inc.
WHITE POLY COVER: Non-marking white poly, 1/16 to 1/8” thick. Available on 3/4”, 1-3/8”, 1.9”, and 2” rollers. RUBBER COVER: Black rubber coated rubber coated roller is 1.9” O.D. and 1-5/8” I.D. with 7/16” hex spring loaded axle. Non-slip surface. 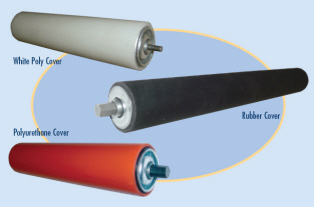 POLYURETHANE COVER: Polyurethane roller is a softer durometer for better product protection. 1/8” thick. Available on 1.9” and 2-1/2” O.D. rollers.